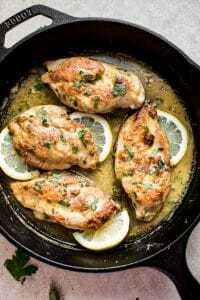 This lemon butter chicken recipe is fast and makes the best dinner. Tender chicken is pan-fried and coated in the easiest, most delicious lemon butter sauce! Cut your chicken breasts in half lengthwise so you have thinner cutlets. Sprinkle them with salt, pepper, and garlic powder. Dredge them in flour so they're nicely coated. Add the olive oil and 1 tablespoon of the butter to a skillet over medium-high heat. Once the pan is hot, add the chicken cutlets and cook them for 4-5 minutes/side or until they're nice and golden. Take them out of the pan and set aside. Add the chicken broth, lemon juice + zest, and remaining butter to the pan and let it bubble for a couple of minutes. Add the chicken back in and cook for another few minutes until it's cooked through and the sauce is further reduced. In most recipes, including this one, I use medium-to-large size chicken breasts. If you buy particularly small ones, you can probably skip the step of cutting them in half lengthwise - just ensure they're cooked through. I used my trusty 10-1/4" Lodge cast iron skillet to make this recipe. I used this zester/grater for the lemon zest.